Feeling Very (New) Balanced & Generous! I’ll be the first to admit that we’ve been a tad partial to Nike when it comes to the big name apparel and shoe manufacturers (lucy takes a close second for our love). And this is because—in all honesty—we love their stuff. We would never fake the funk on something that wasn’t stellar. But I’m thinking that Nike may have a run for its money. Because I’m kinda/sorta in love with New Balance, too! First New Balance agreed to MATCH OUR DONATION to Girls on the Run (Wowie! And we’re still taking comments so go there and comment, too! ), and then they sent me some garb! 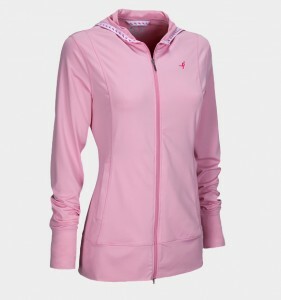 But it’s not just your normal shirts and jackets—it’s their Lace Up for the Cure line that donates 15 percent of its wholesale price to Susan G. Komen for the Cure. So you look fly and give back. Oh, the feel-good sweetness. This lovely shirt has the same style and fit as my Girls on the Run shirt, which I received after signing up for SoleMates. I adore it. In fact, it’s my go-to shirt for long training runs, as it doesn’t chafe and wicks away sweat like it’s nuthin. It’s long enough that the belly stays covered, and it’s slightly fitted so that the look is always flattering. It’s really everything a girl could ask for in a performance T! This sleeveless one is made of the same material as the cap sleeve shirt previously mentioned, but I haven’t tested it out yet BECAUSE WE’RE GIVING IT AWAY! Surprise! (I couldn’t test it and get it all sweaty after all!) The one up for grabs is white, size medium and way cute. Tell us below how much you need it, and we’ll email a random commenter after the giveaway closes in a week that they’ve won!